Luxurious handcrafted Attaché Pochette Purse, wallet by ANDREA JANKE – Exclusive small leathergoods, delicate and sublime manufacture in finest calf skin leather with an remouvable SAGA Scanglow mink cover. This beautiful purse is refined with handpainted edges, the interior is embossed with the typical ‘ANDREA JANKE’-signature, the inner is composed of three main compartments for credit cards, bank notes (€ 500-size), small change a.o. The inside is realized in finest goat velour leather (suede). Dimensions: Length 20 cm; height 12 cm. 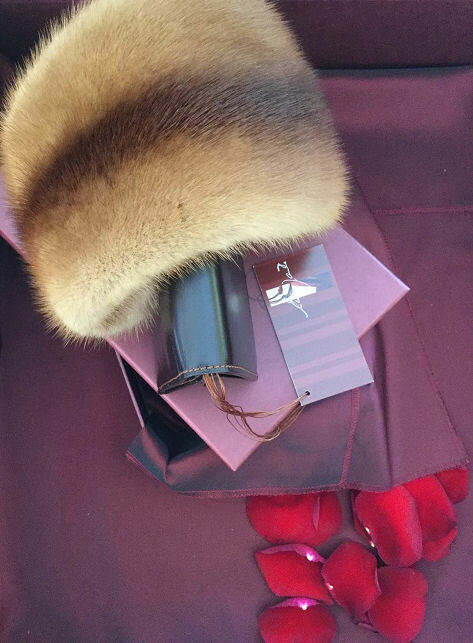 Coloured in dark-brown calf skin leather, sewing is cognac-coloured, matched to the SAGA mink cover. Outstanding craftsmanship and the excellent quality of material determine the fascination of this product line. Sensual aesthetic – significant attributes for the unmistakable character and charm of handbags and small leathergoods by ANDREA JANKE. Pochette Purse by AJ, price: € 445,00 incl. VAT. For more informations and colour combinations contact us to andrea.janke@andreajanke.de. Delivery worldwide from Germany, these exclusive products are enveloped in fine dust bags, packed in an exclusive ‘ANDREA JANKE’-labeled cardboard box. Enjoy Andréa’s one-of-a-kind unique piece – The Grand Attaché Bag ‘Dahlia’ by ANDREA JANKE.